AS IT STANDS: Day of the Demogogue: Will America Become a Banana Republic? Day of the Demogogue: Will America Become a Banana Republic? When Donald Trump gave his acceptance speech at the Republican National Convention he made one thing clear - there will be order, and only HE can make it happen. He mentioned the word "order" throughout his testosterone-fueled address to the audience. He mentioned the word freedom once during his 75 minute rant. He said he would only tell the truth. By the end of his speech he had lied about numerous points. The die has been cast. The Party of Trump intends to push a nationalist agenda that doesn't have room for minorities. Look no further than the NAZI party to understand what's happening here. Racists have found room in the political arena this year and are appealing to a lot of fearful and angry people. All limits on rhetoric have been lifted, and it's scary. In the toxic atmosphere created by Trump, it's okay to run for political offices even if you were an ex-Grand Wizard for the Klu Klux Klan. Enter David Duke, now a convicted felon, having pleaded guilty in 2002 to bilking his supporters and cheating on his taxes. He's running for a senate office in Louisiana. And why not? If Trump can get away with bilking people (think six bankrupties and Trump University), and cheating on his taxes and still get the Republican nomination for president, Duke should be electable too under the current seismic societal shift. The polls tell us Trump supporters are mostly angry old under-educated white men. His followers are motivated by fear. Trump thrives on that emotion. 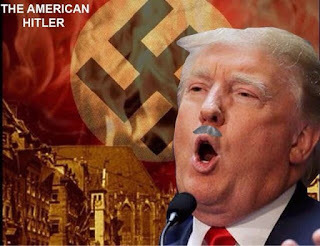 Like Adolf Hitler, Trump uses fear like a hammer, then massages it into the national consciousness like a diabolical masseuse. Don't worry. Don't think. Just vote for the Donald. The message really resonates when he talks about the "good old days," which were also the bad old days for every minority in the nation. We have entered the era of a new demogogue. The Republican convention was consumed by a vigilante rage, complete with mock prosecutors, show trials, and chanting mobs. The picture presented to the world has been of America, as a banana republic. What has happened to our country? Our descent into political chaos has been rapid and perplexing. Is there enough hate and fear to take the USA down the path to it's own destruction? Let's hope not. Only time will tell now.